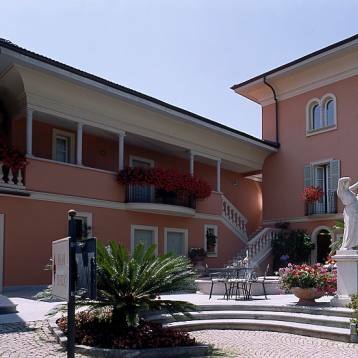 The elegant and tasteful building of the "Villa delle Palme" Hotel stands just a few metres away from the very centre of the picturesque Cannobio, one of the most attractive places on the romantic lake Maggiore. In the new, Mediterranean-style house there are bright rooms with a charming furniture and a refined atmosphere. The Hotel is close to the private beach and has buoys and a towing path available to guests. The rooms have first-class bathrooms with shower and hairdryer. Relax on the balcony or in the small garden on the terrace? You've freedom of choice. All rooms have a TV with Satellite and safe-deposit box. Wireless and hi-speed internet connection are avaiable in every rooms. Reserved car park within the grounds of the Hotel.